There's no denying that the members that make up Melbourne based progressive/industrial/technical metal outfit Synthetic Breed are outstanding musicians. A cursory listen to their first two E.P. 's (2003's self-titled effort and 2005's Fractured) made that quite clear. But if there was one thing that let the band down, it was their song writing. More often than not, their influences were a little too obvious (A mixture of Meshuggah, Strapping Young Lad, Mnemic and Fear Factory), which meant that there was very little originality to be found at times. 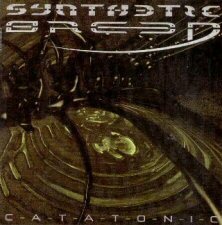 But in the last two years, Synthetic Breed (Who comprise of vocalist Callan Hughes, lead/rhythm guitarist/keyboardist/backing vocalist Vincent Zylstra, rhythm guitarist Darcy Mildren, bassist/backing vocalist Jonas Bahlo and drummer Daniel Luttick) have evolved into something quite different on their debut full-length effort Catatonic. The opening title track Catatonic, although still very reminiscent of Meshuggah structure wise, sounds infinitely sharper, chaotic and more abrasive in its re-worked/re-recorded form than the original version that appeared on Fractured. The same can be said for Chaos Theory (Which simply went under the name of Chaos) and Cybernetics in terms of production and brutality, but it's not the only notable change. On the latter songs, the melodic component of the songs has definitely improved, with the layered vocal performances sounding more thought out and defining, rather than simply sounding like an afterthought that counterbalances the heavier side of the band's sound (Like they did on the originals). And it's that embracing of melodic sensibilities that is evident throughout the rest of the album that helps separate Synthetic Breed from simply sounding like a clone of their evident influences. Neuro Connectivity, Reoccurring Thought Pattern and Techno Sedation (Which was previewed on the compilation album A Blaze In The Southern Skies earlier in the year, and chosen as the first promotional video clip filmed for the album) are all prime examples of where melody and brutality are combined to create a sound that allows the band to show how far both their technical and song writing abilities have come in the last two years. Elsewhere, tracks such as Fragmented Human Structure, Simulated Inception, Autonomic Deficiency, Negative Articulation and the instrumental duo of Modification And Replacement Of Inner Soul Circuitry and Inconclusive Resolution remain true to Synthetic Breed's sound of old - a mix of Meshuggah's odd time signatures, Fear Factory's machine like precision and Strapping Young Lad's sheer intensity blended together into one undeniably talented unit. After a couple of good (But ultimately predictable) E.P. 's, Synthetic Breed has finally unearthed the potential that was clearly within them, and produced something original on their debut album.